I can't begin to tell you how much fun my boys had exploring my inlaws' barn. You can't blame them, as it is absolutely fantastic. 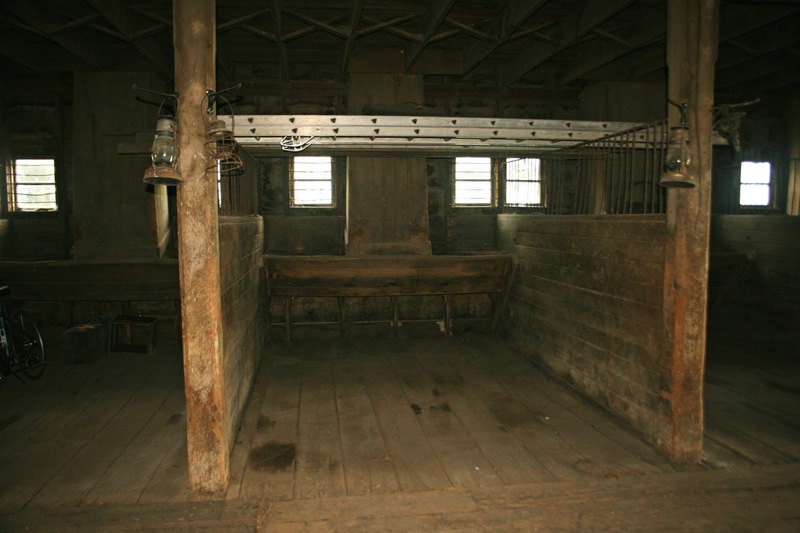 Built in 1900, it has stalls for 22 horses. My father-in-law has done the most amazing job keeping it in pristine condition - no small task considering that roof! The boys all loved how there is a secret nail installed that will open and shut the big barn door. 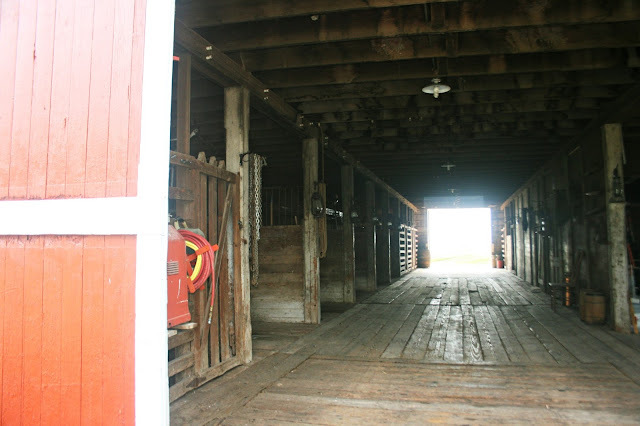 Inside, a long aisle is lined with the original wooden wide planked floor boards. It isn't hard to imagine the flicks of horses' tails, and the stomping of hooves. The stalls are still ready to host equines, with feed buckets in the corners. Did this one house a dappled gray? If you climb the stairs up, you'll find rafters and open space - room for loads and loads of hay. I think you'd be hard-pressed to find a prettier barn anywhere. It certainly spoke to my imagination! 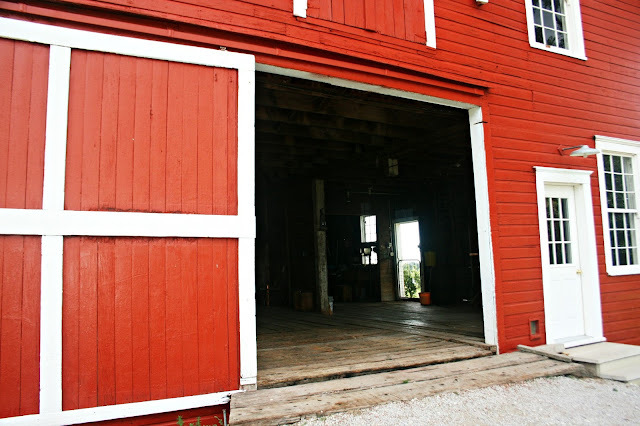 This post linked with Barn Charm Monday. 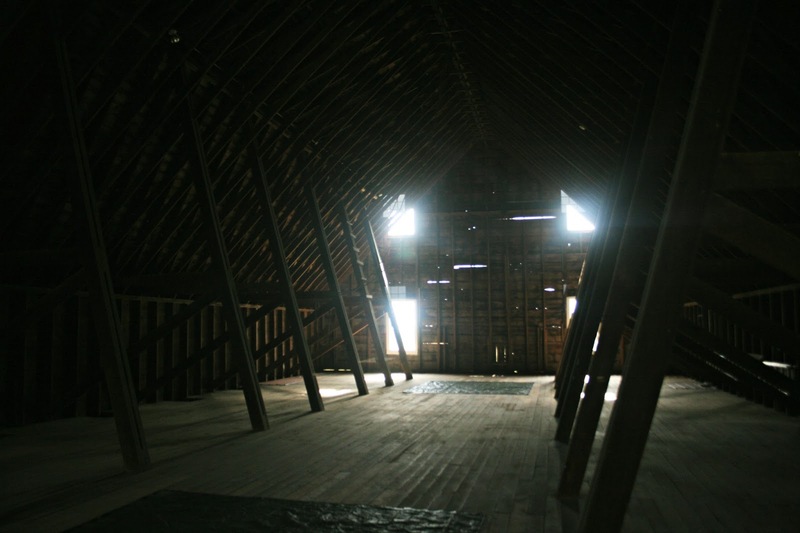 Wow, that is in good shape, the roof looked so good, I am used to looking at falling down barns here. 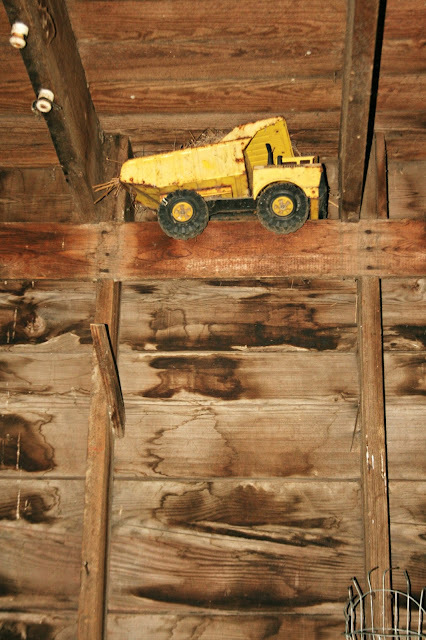 Living in KY I often want to go digging in old barns around here. Not only home for animals many because storage areas for family memories and the like. Being a state with an affinity for horses I have seen barns that were better than many houses complete with central heat and air. I love this barn. Great photos, Lisa. That is a beautiful barn. You should put it on the Blog Hop called Barn Charm. It is really wonderful. He has done a wonderful job keeping it in shape. What a wonderful barn !!!!! Have a wonderful start to your week! What a beautiful barn :) Have a great week! This is a great barn! Thanks for sharing this! That is an awesome barn! It is just beautiful. Wow!!! That is fantastic, and you get to visit it whenever you want. What a wonderful thing for those kids! And it's for sale! My parents are retired and ready to pass this property on to the next family to love. Lovely! @ I have never seen an old barn that empty and in that good a condition. What does he use it for? What a fantastic barn! I'd love to explore that myself. :-) I bet it was a great place to play in and hide in as a child. This is a beautiful barn, anyone could live in it! Your FIL has done a spectacular job...really I wish my home looked as good, inside and out! That is pretty! Some people are turning old barns into homes. That truck made me smile. Most definitely - a very beautiful barn! 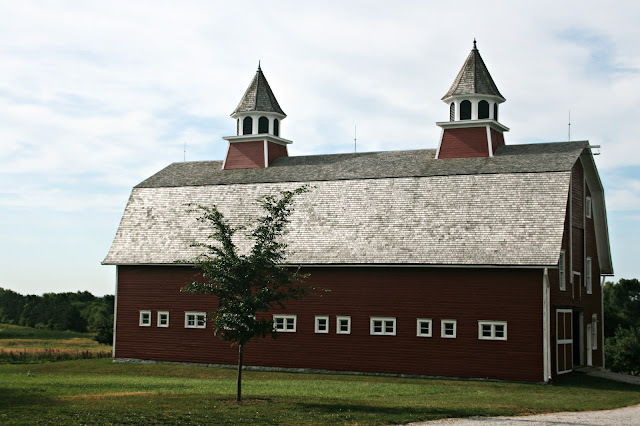 I love barns and this is definitely the finest I have ever seen. Absolutely gorgeous! Oh my!! That barn is beautiful!! My dad's cousin still runs the family dairy farm that was started by my great-great-grandfather. And they still use the original barn...although it isn't as pretty as yours. And it smells a whole lot worse, I'm sure!! Oh Lisa, it's a real beauty! No kidding, best barn ever! How lucky you are to have this in your family. Awesome! When I was a wee thing we lived on the farm that had previously farmed by my grandfather and still belonged to him. The barn had a hay mow and I can still remember playing in the bales of hay up there. Awesome memories. That is such a beautiful barn. I love the smell of hay in the barn and listening to the animals in the early morning waiting to be let out. Oh my GOSH, you are right!! This IS the best barn ever!!! And it is in such great shape!! What is the roof made out of? Do they live very far away? It is a pretty gorgeous barn! That is a beautiful barn! I remember exploring my Uncle's barn as a child... it was awesome ! I know I would sure have fun exploring this barn...it is such a beauty! That is a special barn. Oh WOW! That is in pristine condition!! And so clean!! Was there even a cob web anywhere??? What an absolutely exquisite barn! It's wonderful to see an old beauty so well cared for. Barn is so lovely. I wish I could find such a charming barn! Oh, my! What a lovely place! That is an awesome barn. Glad to see some people still take care of their old barns. Wow! This one is a beauty! Love those large cupolas, too. Wow! That is a wonderful barn! Fantastic barn! How wonderful that it's a part of your extended family! Thanks for giving us the tour inside--that's always a treat. This is gorgeous!!! What a treasure to have for the family; love it. Wow! 50 comments. Well, that barn is cool. I saw a few nice ones on my rural travels this weekend. But not on my farm. It burned down years ago. It's a gorgeous barn! Nice shots! It almost looks like a church with those beautiful cuppolas. That barn is FANTASTIC! I'm thinking of what fun parties could be in there. And what animals could fill it up! This barn is fantastic! I think it's big enough to hold a village exhibition. I could imagine the tails swishing at flies (that was a nice bit of imagery you added ;-). Gorgeous. I love barns. I'm pinning this. 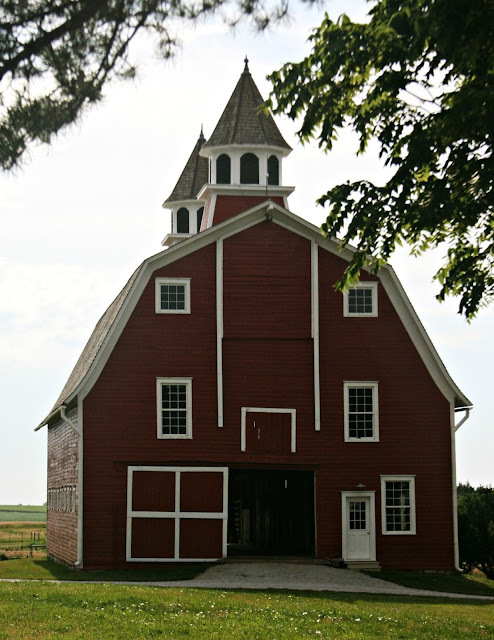 There is a Facebook page called Nebraska Barns. Not sure if this barn is on it, but it would be great if you could add one of your pictures! I love to see all of the pictures of barns, some in not great shape. This barn is FANTASTIC! Thanks for sharing.